Bergmann, a national architecture, engineering and planning firm and one of The Rosenblum Companies’ newest commercial tenants, celebrated a grand opening and ribbon cutting for their office at 2 Winners Circle on Thursday, March 21. 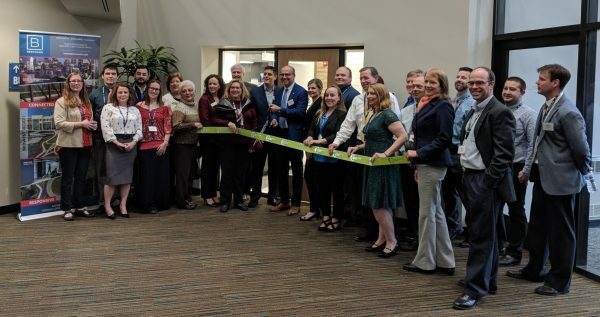 Local officials and ambassadors from the Capital Region Chamber of Commerce joined Bergmann for the ribbon cutting, which was followed by an open house reception and tours of the new space. The Ribbon Cutting in the lobby of 2 Winners Circle. Bergmann has 19 employees locally specializing in architecture, engineering and planning across a number of markets such as government, transportation, retail and finance—and plans to add more staff soon. Bergmann professionals have worked on signature projects in the region such as the Walkway over the Hudson, the renovations at the Empire State Plaza and the redesign of the SUNY Albany Student Center. Recently, the firm received a three-year term contract with the State of New York Office of Government Services for architecture projects across the state. The Albany branch moved to the 9,399 square foot space at 2 Winners Circle off of Wolf Road in February of 2019. The building was one of four office buildings in the Wolf Road corridor acquired by The Rosenblum Companies in 2016. Rosenblum’s construction management team also served as the general contractor on the complete office buildout, which was designed by Bergmann in-house and incorporates a number of environmentally sustainable features while offering room for the firm to grow. To learn more about the firm and the grand opening ceremony, click here. To watch the ribbon cutting ceremony, click here. Take a virtual walk-through of the new office below! For more information about Bergmann, visit www.bergmannpc.com/locations/albany-ny or call 518-862-0325.